This is one of my most unique murals, in a little bathroom adjacent to a home theater. My buddy (Hi Steve) installed a car door on one wall, complete with a drive-in speaker in the window. Yes….a real one! My mural helps give the illusion of being at the drive in at sunset with the snack bar, a garage near by, and…oh do you remember those old playgrounds with swing sets for us kids and our dogs? 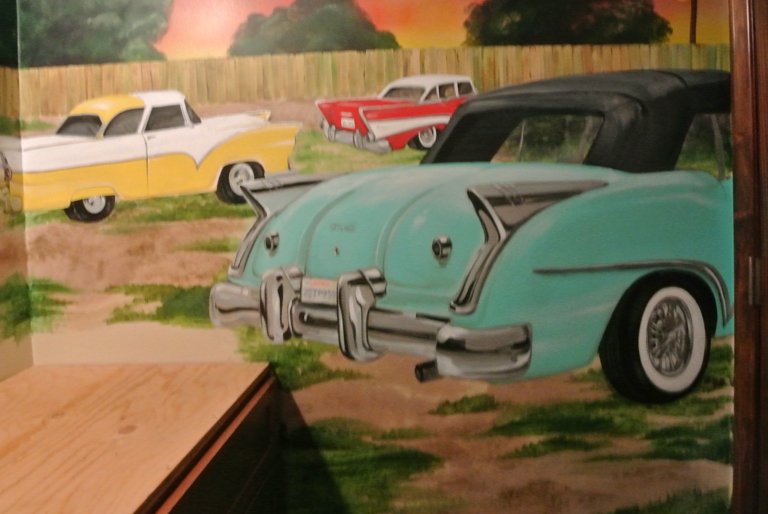 My favorite part to paint was the 54′ Seafoam Green Buick Skylark, a copy of the one in this home’s garage. Sweet. I’m constantly amazed by the creativity swirling around us. What fun. Previous PostBIG Murals. School Murals and Painting on Roof Tops. Yicks!